Three years have flown by for a hard working Bangor University student who graduates with a first-class honours degree this week. 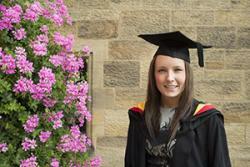 Former Elfed High School pupil, Katie Marie Hyslop, 22, from Buckley, Flintshire graduated with a BSc First Class Honours Degree in Sport, Health and Physical Education. She also won one of three Dr John Roberts Jones Prizes of £800 which are awarded each year to the best students across all disciplines. Katie also scooped up two Sport Science School awards, the Sarah Smythe award for the student who gains the highest average overall mark in the School, and the Psychology Project award for the student who gains the highest mark in a Psychology/Motor control Project. Happy and excited to be graduating, Katie said: “I came to one of the University’s open days and instantly fell in love with the School of Sport, Health and Exercise Sciences. I just got this feeling and knew that Bangor would be the perfect place for me. I came from a small sixth form where all the teachers knew you and it was a friendly and relaxed environment. It was an important aspect for me that by going into higher education, I didn’t just become a number. “Even from the open days, I felt comfortable and right at home at Bangor. The staff and Peer Guides were so helpful and friendly, answering all my questions and I loved the relaxed nature and size of the lecture rooms. The other main aspect that drew me in at Bangor was that I would be taught by internationally renowned researchers. For me this was extremely exciting and such a privilege. “During my first year I took part in a couple of great research projects. For one project, I went to hospital and get my left arm cast for 4 days. It was a great experience but fingers crossed I don’t ever break any bones because I wouldn’t be able to cope for more than 4 days! Another great research project I took part in was with the Psychology department and I got the chance to have an fMRI scan. I really enjoyed getting involved in lots of research projects that students and post graduates were completing. “I was involved with Student Volunteering Bangor (SVB) helping with the Dragon Sports Programme during my first year. I was also a member of the Ladies Hockey Club. It was great being involved with the clubs and societies because I made lots of great friends and was able to play and train in the sport I enjoy and compete against lots of other Universities and also teams around north Wales. “In my second year I become involved in the Peer Guide scheme and thoroughly enjoyed it and became Head Peer guide at the school during my final year. I became a Peer Guide as I wanted to give something back to the University as well as to help new students. It’s been such a great experience, from- organising events for the school to presenting at the Open Days. “The day before my second year exams started, my dad was rushed into hospital after suffering a heart attack. When my mum first told me, I don’t think it fully sunk in the severity of it all and looking back I think I was running off adrenaline whilst I completed my Christmas exams. It was a short time afterwards, from when my dad had had his triple bypass surgery that things became difficult and I came to terms with what had happened. It was a tough few months for me. I found it hard to concentrate, was upset and just wanted to be there for my mum and dad. Throughout it all, I met with my tutor, Jeanette Thom, and other support staff at the school who were all fantastic. They gave me lots of support and put into place things if I needed them to help with my work, deadlines and were always available to sit and have a chat. Little things like this for me made all the difference and kept me going! “The highlight of my time in Bangor has to be getting my three awards and graduating with a first class honours degree. I could of never imagined I would receive any awards on finishing University, and I am honoured and over the moon to be receiving all these awards.